The turducken has achieved legendary status among food items. There’s a visceral appeal to the culinary concept of shoving something delicious inside of something delicious inside of something delicious. Now, the good people at CHOW have taken that idea and applied it to another legendary food: the donut. Shoving what is essentially a type of donut into another donut that has already been shoved full of custard is the kind of excess that I’m pretty sure was the downfall of everyone on Willy Wonka’s tour. And yet, can you blame Laidlaw? 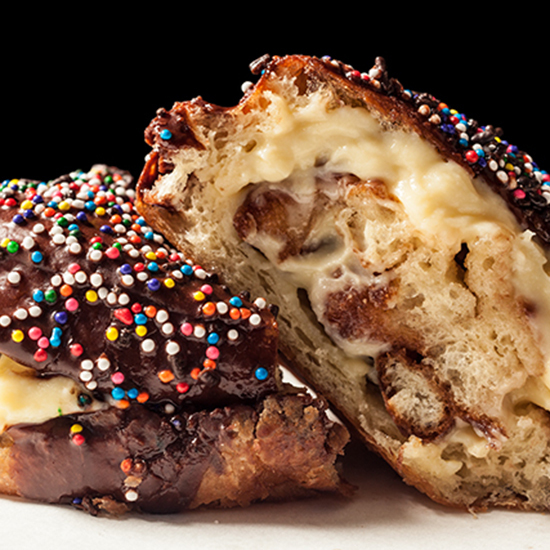 Where one person sees cream filling, another person sees a place to shove more fried dough. Anyway, CHOW hasn’t (yet?) disclosed Laidlaw’s recipe, meaning you’re left trying to play donut surgeon on your own for now. Godspeed.